Published Oct 7, 2015 by Que. Part of the Que Video series. Get a basic overview of OneNote and how it can be used as an information creation, gathering, and management tool on a PC, Mac, smartphone, or tablet. Discover all of the different types of content that can be created or collected within OneNote, plus learn how to use the tools needed to create, compose, and edit each type of content. Discover strategies for quickly finding, organizing, and managing content that you have stored within OneNote, by incorporating Tags or using OneNote's Search tool, for example. Also learn how to delete content from OneNote, plus password protect content stored within specific OneNote Notebook Sections. This group of Lessons focus on specific versions of OneNote, including the Windows 10 and Office 2016 versions of OneNote for PCs, the various OneNote mobile apps, and OneNote Online. This group of Lessons focus on how to use OneNote's Print tool, as well as how to share OneNote Page content via email. How to use OneNote's Collaboration tools is also covered. These Lessons sum up what's been covered throughout this course, offer additional strategies for using OneNote, and discuss some of the ways people can use OneNote in their everyday personal and professional lives. How to Use OneNote® to Manage Your Information is an easy-to-understand yet comprehensive video course that introduces viewers to OneNote, and then explains exactly how to use this popular application to create, collect, organize, manage, share, and archive information using their computer and/or mobile device. Different methods for efficiently creating and managing various types of content are also covered within this video course. This course includes a strong emphasis on demonstrating how to use OneNote in order to create and import content in a variety of different ways, and on how to organize that content so it’s readily accessible anytime and anywhere, from any computer or mobile device that’s linked to the same OneDrive account. From this course, OneNote users also discover how to use the software and mobile app’s collaboration tools. This course uses narrated screencasts, animated slides, and other types of visual content in order to provide easy-to-follow, compressive, informative, and entertaining lessons that allow the viewer to become fully-proficient using OneNote. 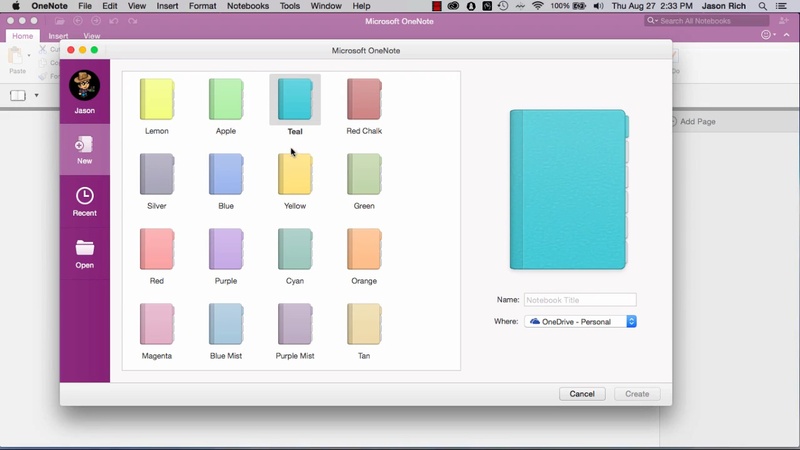 Anyone who wants to start using OneNote to manage and organize their content. Current OneNote users who are interested in learning how to utilize more advanced features or to find more ways OneNote can help them stay organized will also benefit from this course. None, however access to OneNote 2016 or Office 365 would be helpful. Que Video helps you learn technology efficiently with easy-to-follow video tutorials covering popular software apps, online games, and more. All Que videos are professionally produced and feature the highest quality step-by-step instruction designed by trusted authors and trainers from Que Publishing, an imprint of Pearson—the world’s leading learning company. View Que Videos at http://www.quepublishing.com/quevideo.